That’s not marketing, that’s BAD marketing—but it’s clear that there’s a lot of it around. As part of my job as an innovation evangelist, I personally have to wade through huge amounts of professionally-produced yet stultifyingly boring content. Marketers don’t realize they’re being boring. Too many marketers never get to talk to customers. Because they don’t know enough about what customers really care about, and don’t have time to follow industry trends, they unwittingly create materials that miss the point, or cover ground already done to death by others. Limited analytics. It’s hard to objectively measure the quality of most marketing materials. The complexity of today’s sales cycles means it’s extremely difficult to pick apart the importance of any one piece of content. This in turn means each new piece is just a stab in the dark, making it hard for marketers to learn what really works. Surface quality (it’s easier to point to an expensive, professionally-produced video than it is a blog post, even if the blog post was far more interesting to potential customers). Eyeballs, not minds (metrics like the number of clicks on an article are much easier to measure than whether that article actually influenced any customer’s view of your brand or products). Spending money (at job interviews, marketing directors are rated on how much budget they were in charge of: the more they spent, the better). Lack of personal interest. Many marketers are paid to churn out content about things they have no personal interest in—and it shows. Corporate consistency and efficiency. Global brands want consistent positioning, and it’s cheaper (at least in theory) to create centralized, global campaigns. But this inevitably results in lowest-common-denominator content that ignores local interests. Encourage all marketers to engage directly with customers (e.g. using social media to hear what customers are saying, read the thoughts of opinion leaders, etc.). Make sure they have the time and incentives to develop real customer insight. Invest heavily in marketing analytics systems that allow marketers to get as complete a view as possible of what’s happening in the market. Create fewer, better materials (one piece of superior content will have far more reach in the new social era than a dozen pieces of me-too marketing mush). 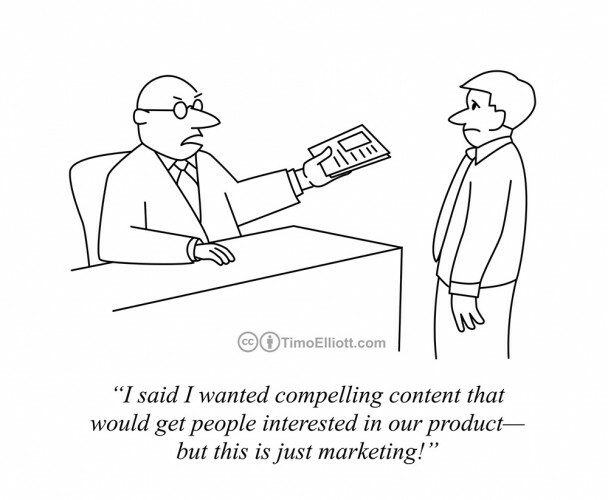 Look outside of “marketing” for your content. Actively seek out and promote insightful materials from front-line employees, customers, partners, journalists, and thought leaders. Provide internal collaborative forums and encourage marketers to actively discuss and debate metrics and best practice. Put consistent education systems in place to make sure all marketers can learn what is and isn’t working. Lay out clear brand guidelines, but encourage local experimentation within those guidelines—with the right analytic systems in place, you’ll soon know if they are successful or not. Ultimately, modern marketing is less about trying to create good content and more about creating systems that ensure great content. For more details, see my previous post on Reinventing Marketing From Scratch.